, an eminent physician, was the son of the Rev. 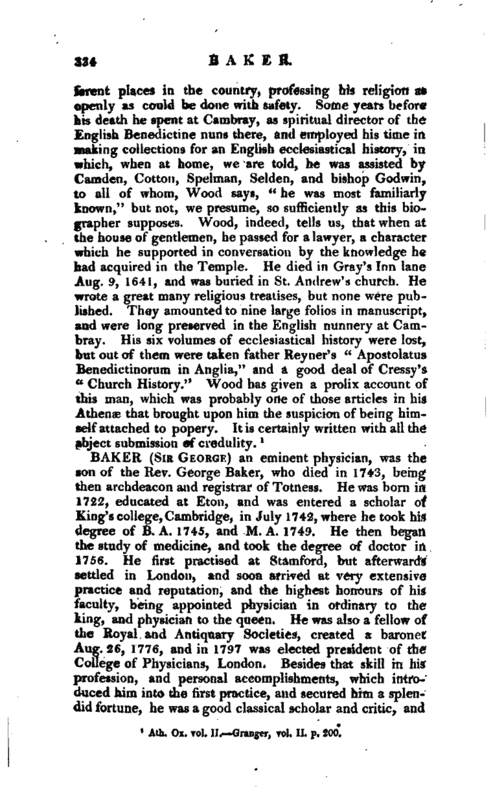 George Baker, who died in 1743, being then archdeacon and registrar of Totness. He was born in 1722, educated at Eton, and was entered a scholar of King’s college, Cambridge, in July 1742, where he took his degree of B. A. 1745, and M. A. 1749. He then began the study of medicine, and took the degree of doctor in 1756. He first practised at Stamford, but afterwards settled in London, and soon arrived at very extensive practice and reputation, and the highest honours of his faculty, being appointed physician in ordinary to the Jking, and physician to the queen. 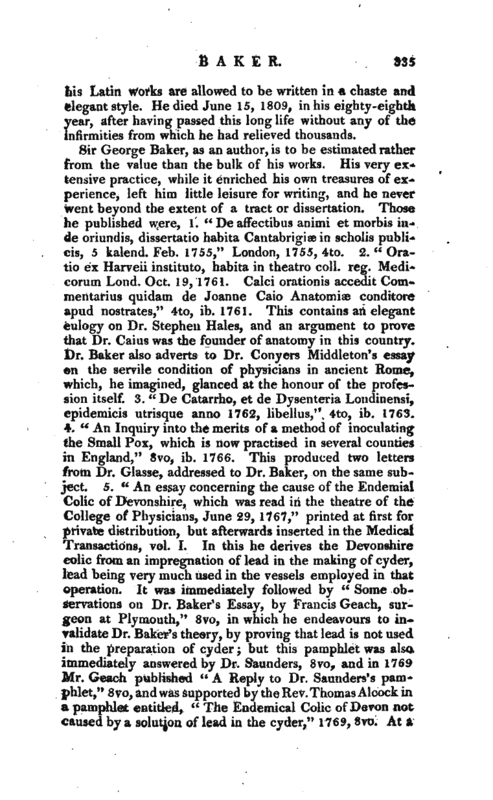 He was also a fellow of the Royal and Antiquary Societies, created a baronet Aug. 26, 1776, and in 1797 was elected president of the College of Physicians, London. Besides that skill in his profession, and personal accomplishments, which introduced him into the first practice, and secured him a splendid fortune, he was a good classical scholar and critic, and | his Latin works are allowed to be written in a chaste and elegant style. He died June 15, 1809, in his eighty-eighth year, after having passed this long life without any of the infirmities from which he had relieved thousands. Nichols’s Life of Bowyer, vol. III. p. 70.—Monthly Rev. 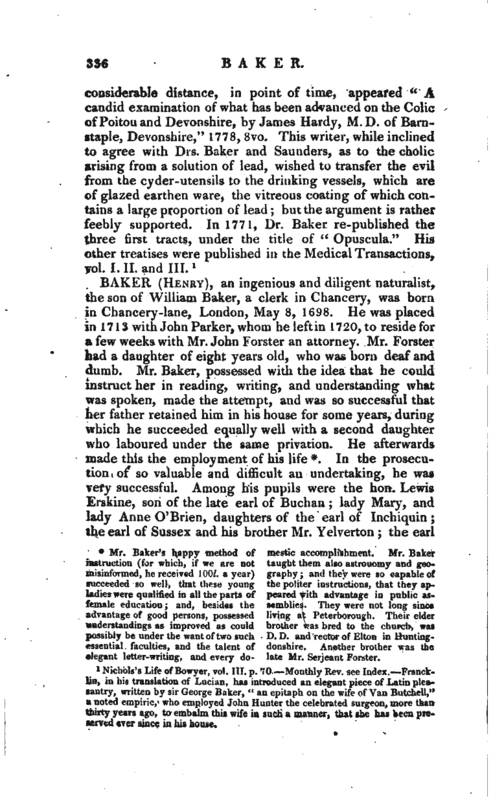 see Index.—Francklin, in his translation of Lucian, has introduced an elegant piece of Latin pleasantry, written by sir George Baker, “an epitaph on the wife of Van Butchell,” a noted empiric, who employed John Hunter the celebrated surgeon, more than thirty years ago, to embalm this wife in such a manner, that she has been preferred ever since in his house.